Between Lattes: We are family; for we're all Reds! 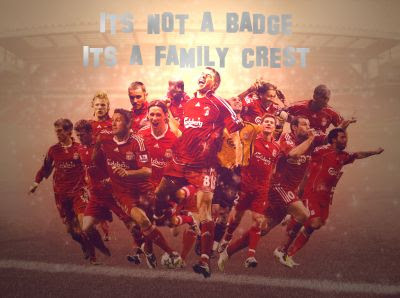 We are family; for we're all Reds! I'm proud of myself. Not for having accomplished any world-changing, Herculean feat - I'm too insignificant for that - but for having brought together an oft-looney, always-fun bunch of previously-strangers-now-family from around the globe under one umbrella. 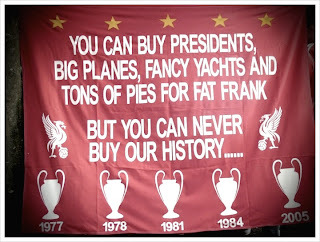 One big red umbrella on Facebook called very simply the "LFC FAN GROUP". It came about by accident, to be honest, for I was still a Facebook greenhorn back in 2010 when I inadvertently set up the group. You see, my intention had in fact been to place all my Red friends' profiles under one group as part of my privacy settings. 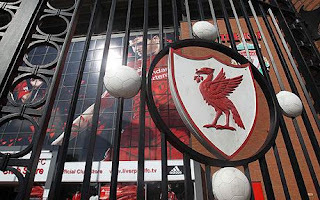 And so I created, well, a "group" and named it the "LFC FAN GROUP"; a simple name that more than serves the needs of a simple man. Of course I now know that I should have created a "friends list" for this purpose. Having said that, my word, what an accident it's turned out to be! For it was through this most unglamourously-named of groups that I've come to meet the acquaintance of so many good, sound, fascinating and yeah, even glamorous folks. To me, everyone in the group is special. Take Sir D, for instance. A fine, noble gentleman from Liverpool who is wisdom personified. Ex-army and a giant of a man, Sir D is never short of wise cracks. Spends of most his days (which are pretty long coz he gets up before the rooster does each morning) DIY-ing his crib and mindin' the li'l ones. Always up for a wind-up and loves a good gab over a pint or fourteen. I respect the man to death. Loves LFC with a passion. And then there's my dear, dear DF from da Pool. Ne'er since the Donnelly docked av I met such a darlin' of a tatty-ead. 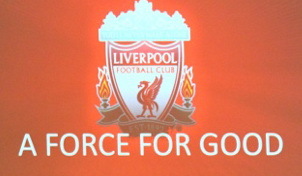 Scouse and proud of it, DF is both me sis as well as me Scouse teacher... and a boss 'un at that too! Drinks nothin' but D.E.P.I. all day. True caffeine addict this one. Whenever I can, I enjoy gabbin' with her 'fore she goes to work in the avvy. DF's not just a norra Scouse friend; she's special. Loves LFC with a passion. Can't wait to meet ya, D... the morra if possible. As for RM, well, she scares me sometimes, but I know she means well and loves me to bits. Highly intelligent (probably too intelligent) and straight-talking, RM's a tough woman from a land where it's tough for women. Probably something she picked up from her big sis. Having said that, I suspect that behind that stone-cold don't-push-me-buddy-boy facade is the most angelic of souls. Amongst the first to join the group, she has pledged to slap me first thing when we meet up one day. Loves LFC with a passion. Love you too, RM. Hang in there. Next up is a man built like Ben Nevis with 1-ton biceps on either side. MF is deathly sarcastic and never short of good jokes; mostly dark ones. Like Sir D, MF's always amongst the first to show up on Facebook every morning. A ladies' man (or so I heard), he works hard and catches the worm early... but he plays hard too (*burp*). And if anyone of you are wondering where the ball from Charlie Adams' cup final penalty's gone, it's with MF. Said so himself. 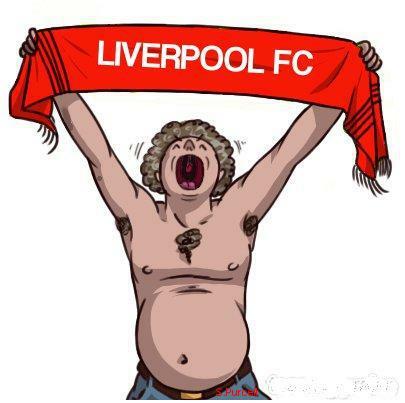 Slaps Mancs to build his biceps and loves LFC with a passion. Moor Street Station two years from now, MF... don't forget. And who could forget SS?... a lovely, lovely lady who REALLY knows her footy. Ask her who scored LFC's equalizer in the 1983 Milk Cup final and she'll not only answer you correctly, hell she'll even tell you in which minute he scored and with which foot! She's a walking football encyclopedia, I tell ya. But if you merely need an intro to Liverpool, look no further. SS will show you the only place on the planet where Catholics worship in a wigwam and also a bloke who's stood exceedingly bare in public , 24 hours a day since 1956. Loves LFC with a passion. What about the glamour bit? Well, that honour goes to VVL; our very own joker and madcap. VVL is both a Jedi Master and a ninja. Soon to compose, record and produce a rap piece, this bloke's multi-talented. No one impersonates the Spice Girls or Wonder Woman like he does; trust me. Seldom serious and always crazy, he once brought me to Anfield by hiding me in his rucksack! Owes me a Strongbow or six (or do I owe him?). Loves LFC with a passion. Love ya, Master. I could go on and on about the other members, but I really don't wanna write this post til 2019. So I'm saving the last for MG. Happy-go-lucky and always game for a bevvy, he's the second biggest LFC fan in the Far East. Yep, you heard right, MG... you're #2. A sound bloke who, like MF, wouldn't think twice about jumping into a mass brawl with Mancs. Looking forward to meeting the lad one of these days. 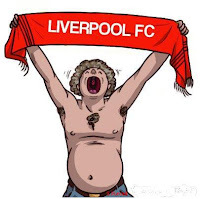 Loves LFC with a passion and hates Mancs even more. For that alone, RESPECT. And so it is that I'm learning more and more about my new-found friends by the passing of each day. What began as an accident has become one of the best things that's happened to me. I love all of you for who you are and more so because we are part of the Red family. 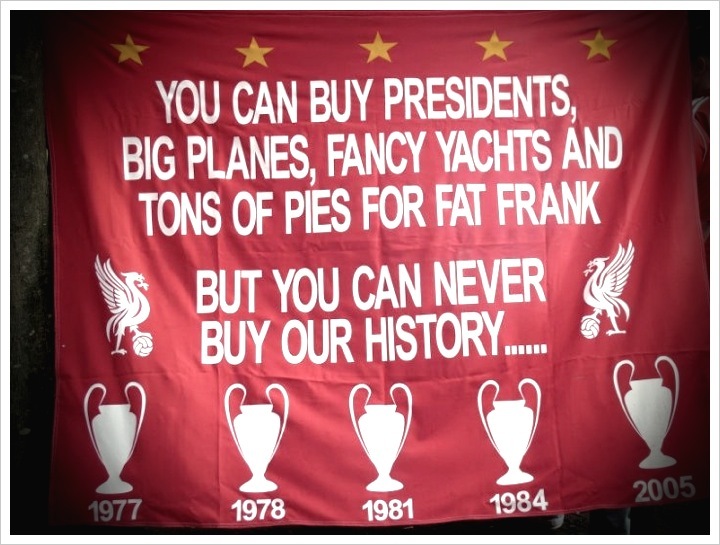 YNWA. Brilliant piece again Vince.....very happy to be part of the Red family.....was just wondering coz i don't really remember.....how did i join this group?....did someone add me or did i send a request to join....hehe i don't remember but am damn glad to be part of this group. I don't normally remember events from the Jurassic Age, bro. lol. Thanks, brother. love this vincent,peeps from different walks of life becoming friends accidently and long may it last,its a pleasure knowing you :) one big red family ynwa! "ya no worra mean lar"